The Deep Sea Drilling Project (DSDP) operated the D/V GLOMAR CHALLENGER from 1968-1983, drilling 1,112 holes at 624 sites worldwide. The DSDP was funded by the US National Science Foundation and several foreign countries through the Joint Oceanographic Institutions for Deep Earth Sampling (JOIDES), and was operated by the Scripps Institution of Oceanography. 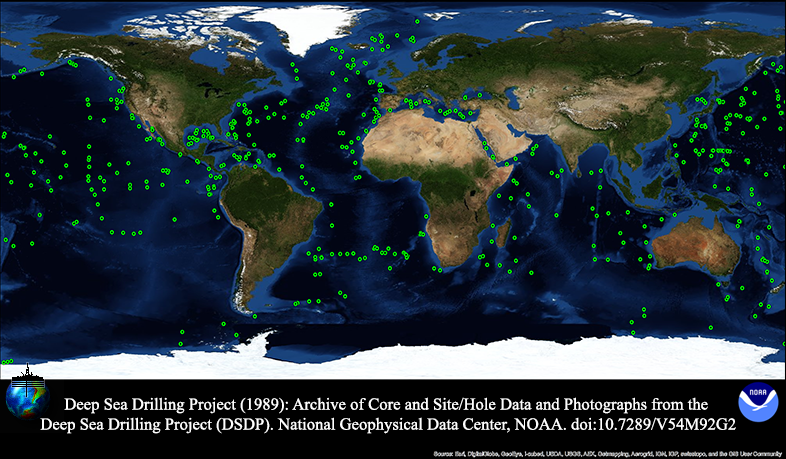 The DSDP data management group at SIO compiled a full suite of computerized marine geological and geophysical data files before they were disbanded in 1987, at which time the data files were transferred to NGDC and to the Ocean Drilling Program at Texas A&M University for distribution.In 1989, with support from, and in cooperation with, the Joint Oceanographic Institutions, Inc., U.S. Science Support Program, NGDC produced two compact discs (CDROM) containing all computerized DSDP data. In 2000, all but the logging and geophysical data were re-released as 1 CD-ROM with an HTML interface. Data are available for free online download. In 2007, the Integrated Ocean Drilling Program (IODP) transferred digital images of all core photographs and closeup core photographs in their collection to NGDC for archive. Due to their volume, these data are not available online, but are archived and available on request. The photo collections consists of 17,635 high-resolution TIFF files, volume 553.34 gigabytes. Text interface to search and download data and access related links through the Index to Marine and Lacustrine Geological Samples (IMLGS). Descriptive data in this system were produced by the staff of the DSDP from the SCREEN and smearslide data files. ArcGIS interactive map interface to search and download data and access related links through the Index to Marine and Lacustrine Geological Samples (IMLGS). Web version of data and documentation from the original 1989 CD-ROM (modified in 2000 for web access) containing ASCII text versions of all prime data files from the DSDP. Data file access by leg, site/hole, data type, and geographic area. How to cite this data set (doi:10.7289/V54M92G2), all access options, and complete documentation. Ocean Drilling Program (1988): Deep Sea Drilling Project documentation files. Ocean Drilling Program Technical Note 9. doi:10.2973/odp.tn.9.1988. PDF document containing an image of the original documentation files for the DSDP prime data types. The IMLGS contains related data and information. Sample information from all phases of scientific ocean drilling, DSDP, ODP, and IODP. The original, 1989 DSDP CDROM set included two discs and access software developed by NGDC for DOS and Macintosh platforms. Disc I contained sediment and hard rock descriptive and analytical data, documentation files, and several summary and reference files. Disc II contained downhole logging in the Schlumberger LIS format, and underway geophysical data (bathymetry, magnetics, and navigation) in the MGD77 format - the borehole and geophysical data are not included in the current metadata record/data set. Not all data types are included for all legs. Data files on the discs include the following: Age profile, carbon-carbonate, core depth recovery, density-porosity, gamma ray attenuation porosity evaluator (GRAPE), hard rock major and minor element geochemistry, thin section and visual descriptions of hard rock samples, interstitial water chemistry paleomagnetism of sediment and hard rock samples, paleonotology (including 22 fossil groups), smear slide descriptions, sonic velocity, vane shear, visual core descriptions, and x-ray mineralogy. Core images were scanned from paper photographs/negatives by staff of the Ocean Drilling Program. Additional images of laboratory forms, were scanned from microfilm under an NGDC CDMP project. All images are available offline only due to volume. Note: on Feb 22, 2006 latitude/longitude information was updated for LEG 001 Hole 2 to correct an error that was present since the files were first transferred to NGDC. ODP personnel certified the correction. The DSDP data were prepared by the Scripps Institution of Oceanography with funding from the Joint Oceanographic Institutions for Deep Earth Sampling (JOIDES). The CD-ROM data set was prepared by the NOAA National Geophysical Data Center with support from the US National Science Foundation through the Joint Oceanographic Institutions, Inc. (JOI). Core Data from the Deep Sea Drilling Project Legs 1-96, World Data Center for Marine Geology and Geophysics, Boulder, Seafloor Series Volume 1, 2000. Digital core photographs were produced by the DSDP, ODP, and IODP. Lineage Statement Prior to transmission to NGDC, the core data were maintained in a pre-relational database management system written in Algol on a Burroughs computer. Data were written off to 9-track magnetic tape for transfer to both NGDC and the successor Ocean Drilling Program (ODP) at Texas A and M University. The Burroughs computer was then decommissioned and no further work was possible to change or correct the data that came from it. Peter Woodbury did do some post-database correction on the SCREEN database. Digital images were scanned by staff of the Ocean Drilling Program (ODP) at Texas A and M University, from core photographs taken by DSDP staff, and some later photographs taken by ODP staff.